Could it be that he wasn't given a song in the upcoming album? Re: Lamineur leaves Ferre's group. I actually like him, unless he joins up with Chikito and Kunzardo he'll be back because there is no space at all in the other groups. He just got there so why would even expect a song if that was the case, he still would've gotten a vocal or two that's better then nothing. I equally liked him. He had very good vocals in QQJD album. His friends/followers on his wall were actually advising him that he is making a mistake by leaving but seems he has made up his mind. What these guys dont realise is that leaving a group means when you come back you would have to start from scratch in terms proving your loyalty to a group and just basically being treated like before. Unless you are super talented. The problem with young musicians these days is they lack patience and want everything fast without really working hard for it. Very true, it's sad man. Very true ndeko. I guess they have never heard the old adage that goes "patience pays". They want to become big stars overnight. Nicodem has the charisma to be a future leader. Although he may not be very strong in terms of vocals. Just like his boss werrason. Nicodem worked hard when he was with Ferre, from atalaku to a singer and was always defending his camp well and plus he’s a courageous young man. This system will never change believe me. 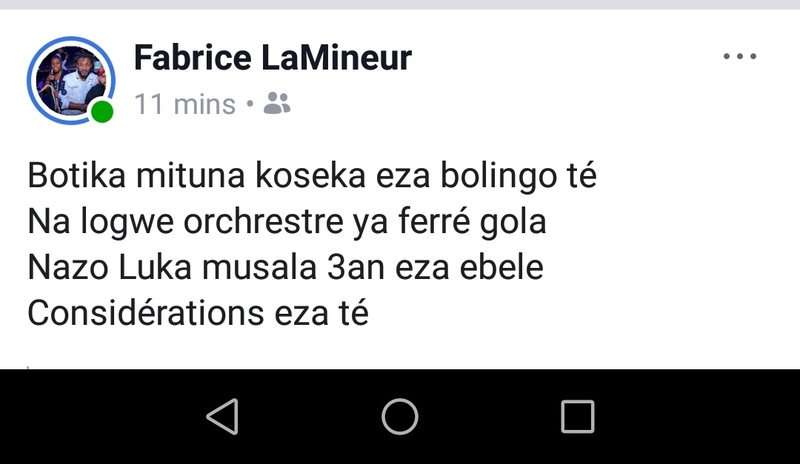 Musicians know the score when they join a band, so leaving to go join another group with the exact structure doesn’t make any sense if your leaving for lack of consideration...seen this time and time, kiriko, Bercy, Degaul, Rize etc....grass is never greener when it comes to Congolese band. True @JV "Roaster Master". Sometimes its not even just the same structures but even worse structures than were someone is coming from. After being frustrated kuna, someone comes back saying "ndako na biso ekomi monene" and expects to be treated the same as before. The train has moved on. If you were a favourite to the boss, someone has most likely already taken your place.